When Toy Story 4 was first announced, the sequel was described as a love story for Bo Peep and Woody. That idea changed over time, and so did Bo Peep, as evidenced in a leaked look at the sequel. The sheep herder is getting a distinctly new redesign in the upcoming Pixar comedy adventure. And we can see why Woody would be head over heels in love with her. Promo artwork for Toy Story 4 gives us our first look at Bo Peep's stunning makeover, and she looks quite fetching. The blonde haired, blue eyed prairie girl has ditched her pink bonnet and dress for a baby blue ensemble with pink accessories. This is obviously a store display, and if you look closely, no, the cardboard cutout isn't teasing the appearance of Thomas the Tank Engine and Friends and their Super Station. That's just a real-life toy shoved up against the art. It is possible that the original Bo Peep is still in the movie, and this is an imposter that moves in on her turf. She certainly looks modernized. The original Bo Peep is played by Annie Potts, and appeared in the first two Pixar classics. She has always been Woody's love interest, but she was suspiciously absent from Toy Story 3. 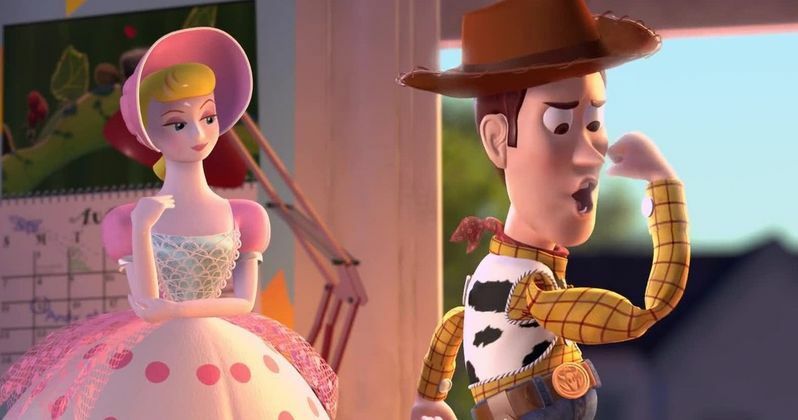 The main story thrust in Toy Story 4's original script had Buzz and Woody setting off from Bonnie's bedroom to hunt down the missing Bo Peep. Rashida Jones and Will McCormack had teamed up to write the screenplay, but they bailed on the project after Pixar head John Lasseter was accused of misconduct in the workplace and took a prolonged sojourn. While the story has shifted focus and won't be a romantic comedy about Woody and Bo Peep's ever-burgeoning relationship, it appears that elements of that have remained, and that Bo Peep will make some kind of appearance. The new artwork was found out in the wild by mariopower.official on Instagram. You can also see Woody and Buzz in the toy store display, though Buzz is getting obscured by that Thomas the Train Engine box. Both Woody and Buzz appear to be keeping their original iconic looks intact for the movie. If they strayed, fans would probably uproar and Pixar would have a backlash on their hands. But changing Bo Peep probably won't rile up anyone outside of Disney purists. John Lasseter was supposed to co-direct Toy Story 4, but bailed on the project after those pesky allegations started to arise. Now, Josh Cooley is the man responsible for bringing these fan-favorite toys back to the big screen, with the movie set for release this summer. We've seen a couple of teaser trailers, which introduced new characters Forky, Ducky and Bunny. None of the story has been revealed, except that Woody and Buzz will be leaving Bonnie's bedroom for a new adventure that finds them visiting a local carnival.